Prime Minister Datuk Seri Najib Razak and his wife Datin Seri Rosmah Mansor arrived in New Delhi tonight to attend the two-day ASEAN-India Commemorative Summit starting Thursday. BERNAMA Photo. Prime Minister Datuk Seri Najib Razak and his wife Datin Seri Rosmah Mansor arrived here tonight to attend the two-day ASEAN-India Commemorative Summit starting Thursday. 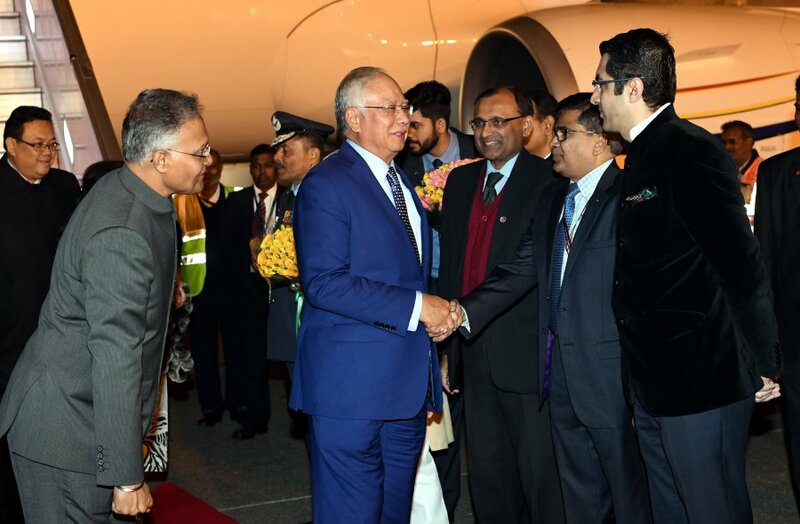 On their arrival at the Palam Air Force station here, they were welcomed by Indian Minister of State for Finance, Shri Siv Pratap Shukla, as the minister-in-attendance, Malaysian High Commissioner to India Datuk Hidayat Abdul Hamid and Indian High Commissioner to Malaysia T.S. Trimurti. The ASEAN-India Commemorative Summit, themed “Shared Values, Common Destiny”, will be held in conjunction with the 25th anniversary of ASEAN-India dialogue relations. On Thursday, Najib’s schedule will begin with an official luncheon hosted by the President of India, Ram Nath Kovind, at the Rashtrapati Bhavan in honour of the ASEAN heads of state and heads of government before he proceeds to a closed-door retreat session on maritime cooperation and security. At the Commemorative Summit, the leaders are expected to adopt the Delhi Declaration to strengthen ASEAN-India cooperation and collaboration mainly on combating terrorism, regional connectivity and business ties as well as deepening people-to-people interaction for regional peace, stability and prosperity. Najib is scheduled to call on his Indian counterpart Narendra Modi on Friday to discuss issues of mutual interest. Prior to the meeting, Najib will be joining other ASEAN leaders as chief guests at the Indian Republic Day parade at India Gate. He is also scheduled to perform Friday prayers at the Jama Masjid of Delhi, one of the largest and historical mosques in India. Meanwhile, in a separate programme, Rosmah will visit the Swaminarayan Akshardham Temple to have a view of the complex which displays millennia of traditional Hindu and Indian culture, spiritually and architecture.